A simple, accessible-yet-difficult, fwooshy, “feel good” flight sim. Blow things up on an infinite number of procedurally-generated islands, but watch out for volleys of missiles; when you die, you're dead. Alpha 21 "Charlie Foxtrot" Released! 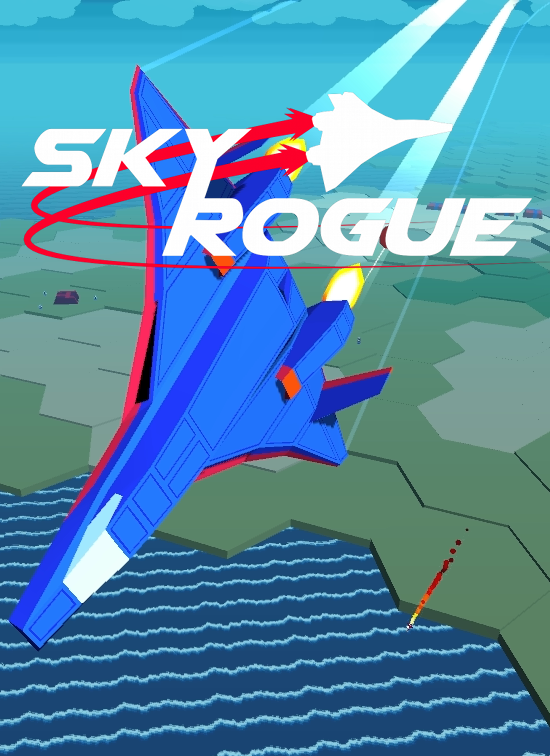 Vote for Sky Rogue on Greenlight! Like before, dying will make you lose all equipped weapons. You'll need to re-build them to use them again. The default loadout for every aero only uses free weapons... no more "free lunch" with non-free default weapons, sorry. The enemy will send reinforcements to the island if it feels you're too much of a threat. Colliding with aircraft (dead or alive) will no longer kill you, but it will screw up your orientation pretty bad. MIRV missiles pick their targets in a round-robin style for better distribution. They are now MUCH more useful for taking out drone swarms. RIG structures temporarily removed, they will come back with sea-based defenses! Fixed: some GUI elements were visisble in the flyby camera, now EVERYTHING is disabled for cooler screenshots! This version brings sky carriers and a tutorial, along with a number of fixes and tweaks. Changelog in the details! In case you missed my mention on twitter, I released a new version that fixes some bugs, namely one that kept Mac users from playing at all. Lots of bugfixes and minor changes! Mainly focusing on controls on this update, but I snuck in some gameplay improvements as well. Alternate micromissiles, along with usability tweaks and bugfixes. I did a Let's Play/First impressions on this game! Come check it out if ya like! Big thanks to the developer for this great game! yeah.. that. the game is less than 100 MB and you could run this on yo' grandma's rig. Great game so far. Definately want this game to be released on Steam. Will you add Multiplayer in the future as well? Also, I think i've found some bug. 1. Reaching Tech Level 24 or getting more tech point will make the game freeze and forced to abandon the progress. 2. The game has trouble understanding custom key mapping. Putting a Button13 will result in Button1+Button3 in the game. Looks like Update 21 made turrets the to spawn on water. Perhaps require a quick hotfix for it? welp, sorry, didn't read the changelog. Alpha 19 is the best update so far! -It somehow much laggier on my laptop (used to ran smoothly under 'Awesome' graphics quality and 1366x768 resolution), especially when there's too many explosions happening/hectic. -The 'unselectable plane's default special weapon' bug still hasn't been fixed yet. i.e if you replace cluster bomb from Kondor's default loadout with other weapon, you can't switch it back to cluster bomb until you buy it from the store since cluster bomb isn't listed in inventory by default. Why Alpha 18 is not in IndieDB ?